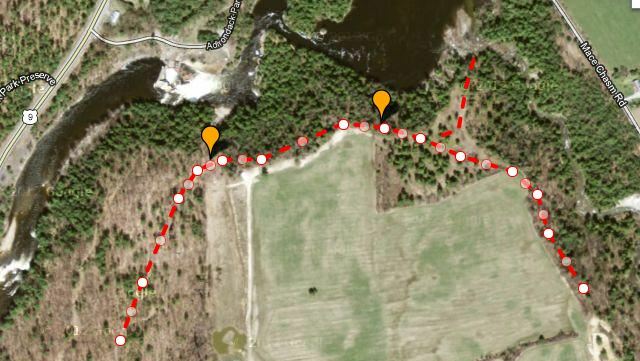 Mapping deer is an advanced hunting skill, but it’s really not difficult to learn. It requires basic knowledge of deer behavior and how deer behavior changes with regard to environmental conditions and resource availability. It also requires a basic knowledge of how to read aerial photos and topographic maps. By learning to identify key features of the landscape that funnel deer, you can cut down your scouting time significantly, and put yourself in pretty good position to have a successful season. Keep in mind that mapping deer does not replace “boots on the ground” scouting, rather it just steers you in the right direction and prevents you from wasting time scouting areas with less potential. In the following series of articles, I will use BGL’s “Custom Overlays” feature and switch between satellite view and topographic view to identify important landscape features for “speed scouting.” This should help BGL users realize the usefulness of the “Custom Overlays” tool, as well as improve your deer mapping skills. Today’s subject is water! Most bodies of standing water serve as natural barriers to deer movement. Given the choice to swim across a body of water or walk around it, deer will usually walk around. During the rut, bucks will often skirt the edges of large water bodies while searching for does. 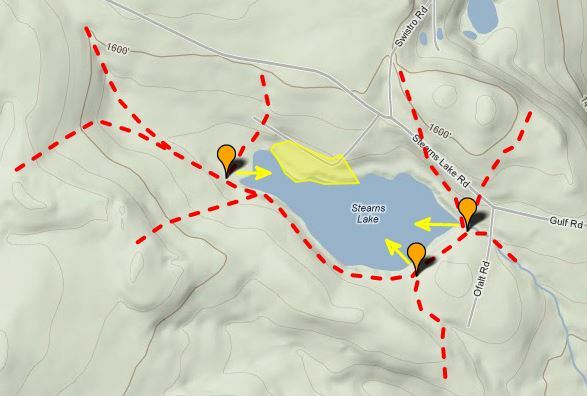 Using the “Custom Overlays” tool, you can draw paths around the edges of ponds and other barriers to help you envision how deer will move through those areas, and add markers to areas that are obvious funnels or bottle necks for future scouting purposes. As you can see in the diagrams below, I put orange markers at locations where several paths come together. Those are the areas I would scout. The yellow arrows indicate a favorable wind direction at the marked locations and the area outlined in yellow indicates an area with several houses that deer are likely to avoid. Figure 1. 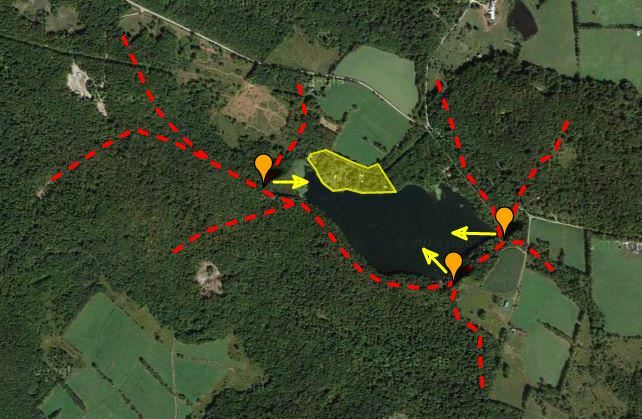 Aerial image of potential pond set-ups made with BGL’s “Custom Overlays” feature. Figure 2. With just the click of a mouse you can switch between topo map and aerial image views and the overlay will remain in place. Again, although deer can swim, they usually choose not to. Keeping that in mind, rivers are generally another barrier to deer movement. Bucks in search of does can be expected to walk parallel to the river. Knowing this, I often search for areas where other barriers would create a bottleneck or funnel. An additional benefit to hunting near a river is the sound of running water can help mask the sound of a hunter’s approach. Figure 3. The river to the north should help funnel deer through the forested area along the field edge. The orange markers indicate areas I would scout first for deer sign because those areas appear to be funnels. Streams and creeks are not as much of a barrier to deer, but there are often distinct crossing points. Although these features are not my first choice for speed scouting in big woods, they are my first choice for scouting properties in the Midwest. If you are a big woods hunter, the idea behind these features is that deer need to cross them somewhere. Your job is to walk along the creek and find the crossing areas where tracks are cut deep into the mud (i.e. find the bottlenecks). 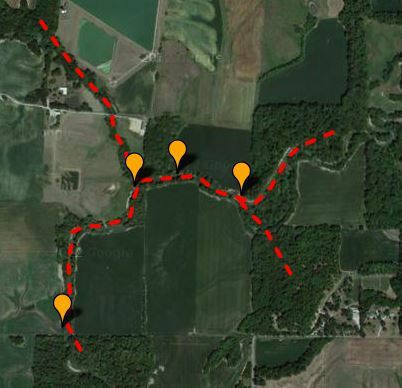 However, if you’re a Midwest hunter, creek bottoms are about the only places a plow has not touched, and as such provide necessary cover for deer to get from point A to point B. Chances are there will be a deer trail that looks like a cow path traveling through these bottoms. Find the trail, and set up downwind. Figure 4. Creeks and seasonal streams are often difficult to identify on an aerial image, but they are easy to identify on a topo map. 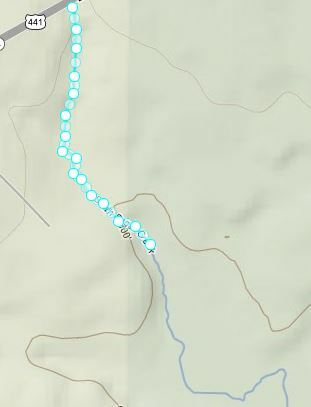 Shown above, I am using a blue line to delineate a stream that runs through a property. Figure 5. Once delineated with a “Custom Overlay,” streams are much easier to identify on an aerial image. Figure 6. The mid-west is ideal landscape for hunting deer. Once the crops are harvested, small woodlots are about the only places where deer can hide from hunters (i.e. we can predict that the deer are going to be in the woodlots). 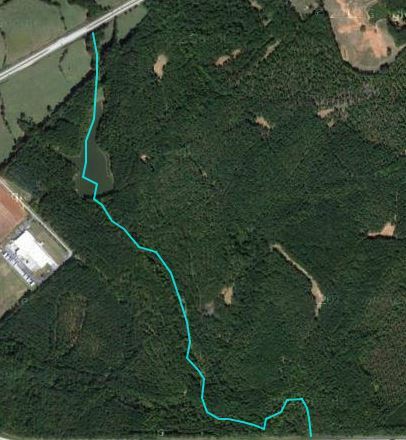 These woodlots are often connected by vegetated creek bottoms, so if a buck searching for does wants to get from one small woodlot to another, you can bet he’ll probably want to use the creek bottoms for cover. This concludes the first tip for mapping deer, but it’s surely not the last word with regard to using water features to map deer. If you have other water feature mapping tips, please share them on our Facebook page. We look forward to hearing your tips and feedback!